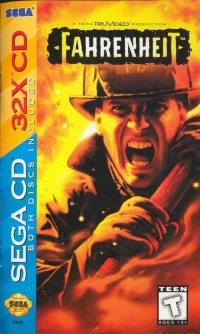 Description: Includes 2 discs; one Sega CD, one Sega CD 32X. 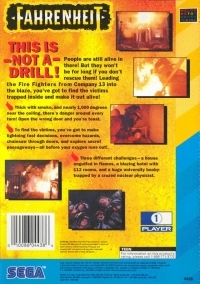 Box Text: People are still alive in there! But they won't be for long if you don't rescure them! Leading the Fire Fighters from Company 13 into the blaze, you've got to find the victims trapped inside and make it out alive! 10-27-2012 exonerator Description Includes 2 discs; one Sega CD, one Sega CD 32X. 10-27-2012 exonerator Box Text People are still alive in there! But they won't be for long if you don't rescure them! Leading the Fire Fighters from Company 13 into the blaze, you've got to find the victims trapped inside and make it out alive! This is a list of VGCollect users who have Fahrenheit in their Collection. This is a list of VGCollect users who have Fahrenheit in their Sell List. This is a list of VGCollect users who have Fahrenheit in their Wish List.